What are the main styles of teachers' furniture for classrooms? Today's teacher podiums are found in not only in school and university environments, but in training facilities, conference centers and offices. 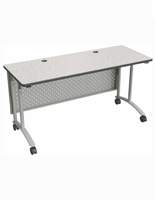 Presentation and teaching stations need to be sturdy enough to withstand daily use and well-designed to accommodate the changing tools used by educators at all levels. These include mulitimedia stations that accommodate a variety of electronic presentation devices, as well as simple lecterns that provide focus to the speaking engagement at hand. 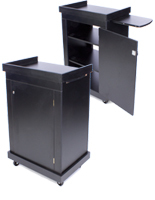 Our teacher podiums are in stock in a variety of styles and constructions guaranteed to meet the teaching, and budgetary, needs of almost any organization or business. Today's classroom lectures and presentations can require a wide variety of devices, from laptop and desktop computer setups to webcams, projectors, codecs, speakers and more. Our multimedia lecterns and teaching stations are designed with usability in mind, incorporating cable and power management features as well as easy mobility and accessibility. 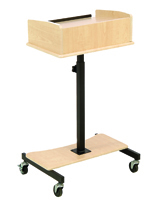 Our classic teacher podiums include freestanding fixtures as well as adjustable lecterns designed to convert from floor stands to table or desktop classroom furniture as needed. 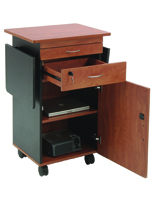 Designs range from traditional wooden teaching stations with open backs for accessory storage to elegant floor pedestals designed to attract and hold public attention. 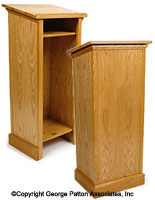 Each of our stand up teacher podium models provides detailed information on size, construction, finish and options to help select the right match. Training tables are the time tested way to gather students while saving on space and computer training tables are the next step in the evolution of the modern classroom. 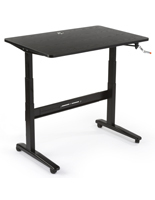 Another evolving line of business and school furniture are sit-stand desks. 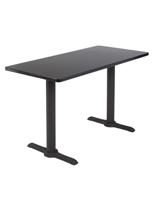 We offer both of these lines of tables and desks for educational and business needs here on Podiums2go.com. 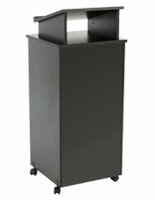 Rolling teaching pedestals often need to serve as multifunction classroom furniture. 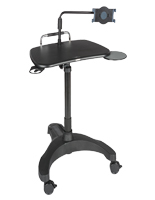 Small, lightweight fixtures with wheels and multiple work surfaces can easily accommodate use as mobile lecterns, temporary desks or presentation stands. Modern classroom furniture must balance style and changing technology with cost-efficiency. The public location of educational lecterns and presentation stands requires a certain sturdiness of construction as well as durable materials. The majority of educational and training facilities need school furniture that can meet changing needs over years of use. Teaching lecterns, frequently referred to as speaker or presentation furniture, are by their nature some of the most versatile fixtures available. 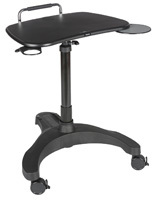 Convertible or adjustable stands that transform from full size to tabletop can be utilized in different rooms or environments with ease. 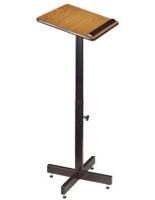 Adjustable height fixtures accommodate different users, speakers or presenters. 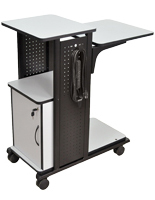 Well-designed teaching stations combine built-in accessibility features such as power and cable management or ventilation with variable shelf and storage configurations designed to work equally well for older technology and newer, cutting edge presentation equipment. What materials are used for training and school furniture? 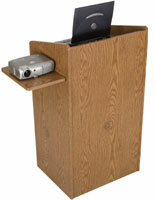 Wooden podiums: Veneers and solid wood lecterns are in many ways the gold standard of teaching pedestals. 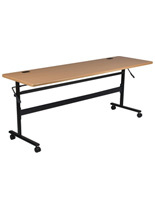 Floor stands for lecturers can be found in auditoriums and lecture halls as well as in individual classrooms. Designed to provide both support and visibility for speakers, this type of heavy furniture is available in many different finish colors. Due to the weight of the fixtures, these stands often include hidden wheels that make them easier to relocate as needed. Manufactured wood & composite training presentation stations: Modern construction techniques utilize man-made materials such as MDF and engineered woods to create lightweight presentation furniture that maintains the look of traditional wood but offers excellent economy for budget-conscious facilities. 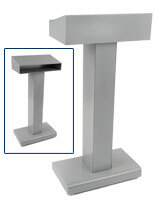 Metal pedestals: Durable steel and lightweight aluminum both offer a wider variety of design options than standard wooden construction. 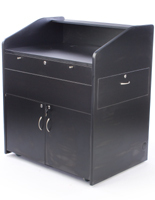 Welded truss-style stand-up lecterns are perfect for imparting a modern, contemporary look. Versatile aluminum is frequently used in conjunction with other materials to create composite fixtures designed for maximum durability and portability. Acrylic lecterns: Lightweight and durable plastic lends itself easily to different finish colors as well as to ultra-modern crystal clear constructions. Easily imprinted with school branding information, acrylic classroom furniture is an economical and stylish alternative to traditional wooden teaching fixtures. Teaching stands, lecterns, and podiums intended specifically for classroom or training purposes need to balance their position as fixtures intended for years of long use with their ability to adapt to on-going changes in educational tools and styles. Economy, style, and usability features vary widely among the many designs, allowing schools, universities, and businesses in all industries to match their equipment perfectly with the needs of educators and training staff. Our wide selection of podiums for sale includes fixtures designed to specifically meet the needs of the training and education community at economical prices.